I love a list (or two!) so these books are right up my street. They're great as I tick off the places and gardens I've visited, as well as providing some inspiration on where to go and what to see while there. Ticking the places I've been to is one occasion I write in my books. The other is in cookbooks on recipes I've cooked. But other than that I very rarely, if at all write in my books - is that strange, do you write in your books? Do you have any other habits with books? The 1001 Gardens is a recent birthday present from MOH, and reminded me of the 1000 Places book which I've had a while now - I mean, it has an £11.99 Books etc price tag on the back cover! So, how am I doing against these lists? This post has given me a good excuse to take another look at the Places book to see if I could tick anymore - I could, somehow I'd managed to miss ticking the Grand Canyon! That's not the sort of place you expect to forget, is it? Especially as we have great memories of our helicopter trip over it with a young German pilot cracking jokes of a European nature for the Americans on board who were really nonplussed by his accent, and the jokes! And of course there were amazing views in our next-to-the-pilot seats! So I've now ticked 85/1000 Places, unsurprisingly with the majority of these in Europe. I did score in the Africa, Asia, Australia and New Zealand, Caribbean and US and Canada sections too; but nothing in the Middle East or Latin America... yet! The gardens book is newer so this was a chance to take another, slower and more deliberate look at the book - I've discovered some beautiful gardens all over the world which I daren't make my own list of. But I'll know where to look when we plan our holidays! I've actually been to 34/1001 Gardens, which isn't bad as I think gardens really do grow on you (sorry!) Once again European gardens feature heavily, but I'm also proud to have made it to 4 North American, 2 Asian, 1 Australian and 1 Island garden (using the book's geographical zones). There's plenty more I want to visit though! Clearly these books don't include everywhere and are a compilation of one or more person's view. I've been to plenty of other places and gardens which don't feature in these books, and that's ok - but for me, as a list person I love to tick things off lists! 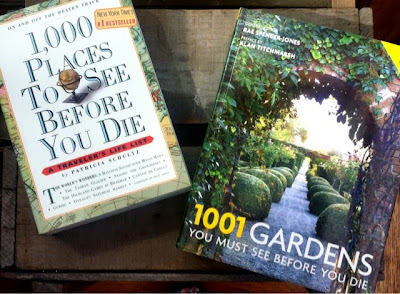 And btw, despite the titles of both these books referencing it, I'm not planning on dying anytime soon. I mean there's still plenty of places and gardens to tick off my list yet! 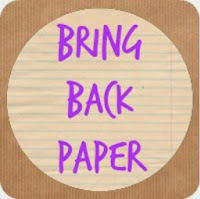 What paper do you have in your life right now?